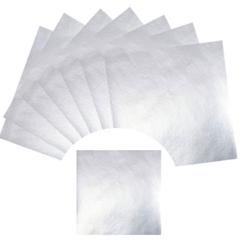 Silver Foil Origami Paper is a staple for any origami artist. Each sheet has a shiny silveer foil face and white on the reverse. Choose from 3 different sizes including 3" x 3" with 100 sheets, 4.5" x 4.5" with 36 sheets, and 6" x 6" with 36 sheets. Silver Foil Origami Paper Kit with Instructions 3"
Silver Foil Origami Paper Kit with Instructions 4.5"
Silver Foil Origami Paper Kit with Instructions 5 7/8"
Looking for a totally shiny paper sculpture? These packs of Silver Foil Origami Paper are perfect for any project needing a bright, reflective look. Foil provides properties not found in traditional paper, such as its malleability and its ability to hold a curved shape. Included in the pack are basic origami patterns and instructions. If you need only foil accents in your project, check out our Foil on Solids Origami Pack. Choose from 3" x 3" with 100 sheets, 4.5" x 4.5" with 36 sheets, and 6" x 6" with 36 sheets.